“Better Horses TV is all about the love of the horse." It is our way of saying thank you to our friends and horses that we have met and are meeting through this journey! Join show host Ernie ‘The Horse Guy’ Rodina every Sunday morning on KCWE Channel 29 at 8:00 am Kansas City, KSNW-TV in Wichita at 6:30 am, KSNC-TV Great Bend, KSNG-TV Garden City, KSNK-TV Oberlin, KSNL-TV is Salina and KTMJ-TV in Topeka at 6:00 am. See the next horse adventure on the unbelievable Better Horses T.V! Better Horses airs weekly on a world wide program that has over 25 stations across the Midwest as well as a local show "Better Horses Connected" airing Saturday mornings on KFKF Country 94.1 FM. These programs offer education and information on a wide range of topics such as horses, horses training, cowboys and cowgirls, some cattle and even Roy Rogers! The "Better Horses Connected" radio show aires weekly on Kansas City’s KFKF Country 94.1 FM on Saturday mornings. It is our local version of the Better Horses Radio Regional World Wide Show. With hosts, Ernie Rodina along with Ed Adams Better Horses Connected zooms in on local news and events while at the same time utilize enjoying top midwest talent. You can also listen live every Saturday morning at 5:00 am CST or visit our podcast "Better Horses"
Host Ernie Rodina and Ed Adams discuss horse tips with todays equine professionals. The Better Horses World Wide Radio Show is a weekly program that airs an hour of great Equine Information to our listeners. We are currently airing on over 25 stations across the Midwest, from western Oklahoma to Augusta, Georgia! We talk about God, horses, horse training, cowboys, cowgirls, rodeo, equine health, some cattle, and even about Roy Rogers. We love horses, horse folks, and the Western Way of Life and hope you enjoy listening to this show, as much as we love doing it! Check out the current listing of shows! The Better Horses World Wide Radio is available as a podcast. Search for Better Horses on your podcast app. and listen to previous shows or download on any mobile devise. Subscribe to Better Horses Newspaper Today! 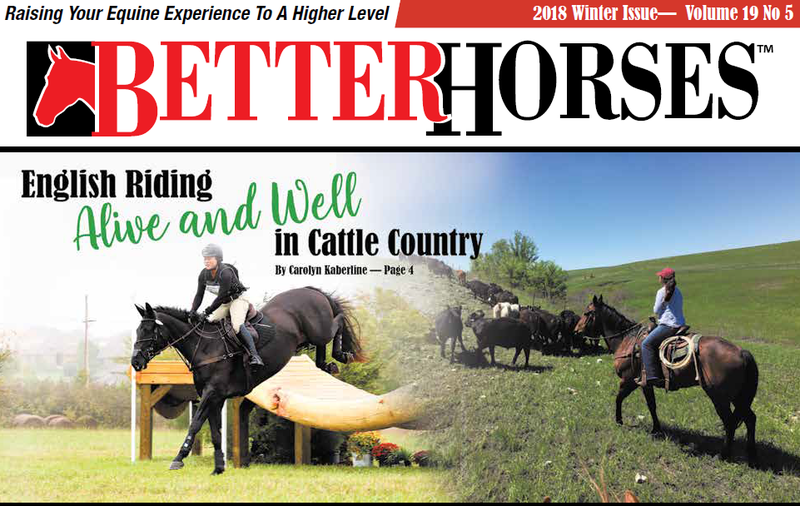 Sign up today to start receiving a copy of our monthly newsletter or signup to receive a copy of the Better Horse Network paper in the mail. There is a $15.00 annual subscription for the paper copy (printed 5 times per year). 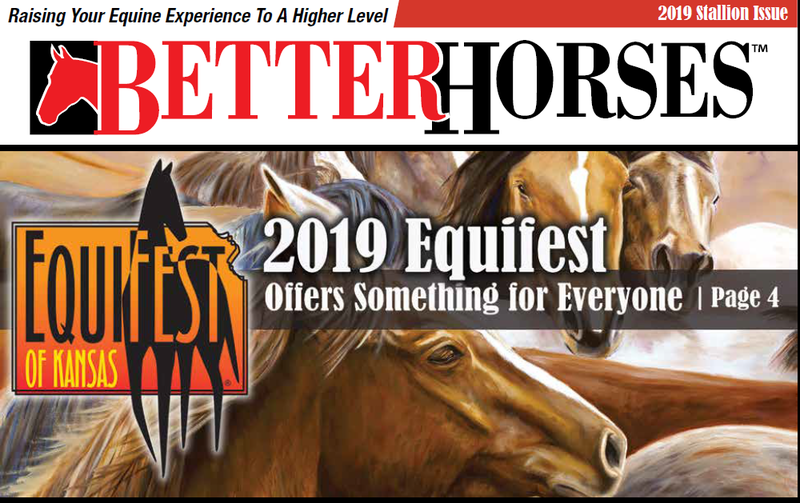 2019 Equifest Offers Something for Everyone (P4) - Renowned Quarter Horse Breeder Always a Cowboy Continues Work on Horseback (P8) - Euthanasia - A tough, But Merciful Decision to Prepare for (P11) - Cowboy Church with Steve Stafford (P14) - Self Wrighteous (P16) - Doc Rock's Repro Tips (P23) & Many More! English Riding Alive and Well in Cattle Country (P4) - EPM: A Frustrating Neurologic Disease (P7) - Linn County Fair Rodeo Honored as "Best of the Year." (P10) - Working Cowboys from Kansas Ranches Collect Top Ten Awards At World Championship Ranch Rodeo (P14) - Planned Museum Features Old West Cattle Drives (P19) & Many More! 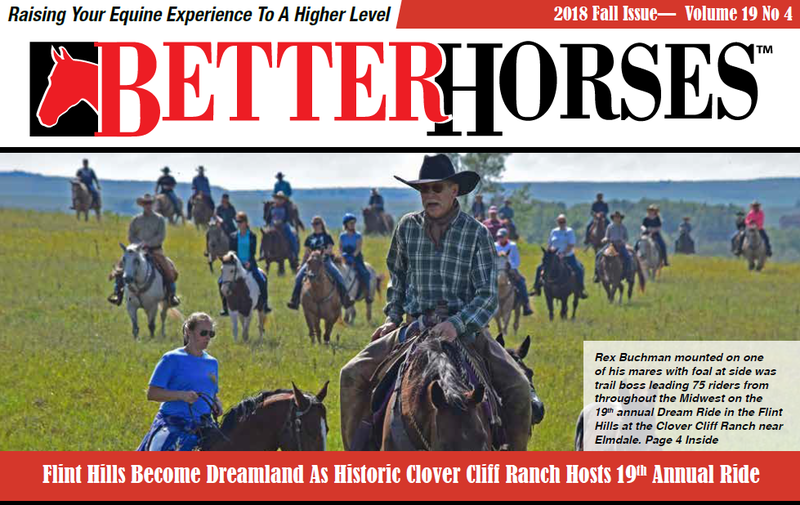 Flint Hills Become Dreamland (P4) - Where Have They Gone (P11) - Our First Year and the Races (P13) - Mustang Beginnings Challenge Attracts Youth To Train Horses From The Wilds Rodeo Stars Claim Championship Buckles (P23) - Scholarships To Youth For Education Toward Career Horse Endeavors (P41) & Many More!